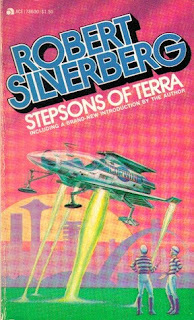 Stepsons of Terra, by Robert Silverberg: Ace, 174 pages. According to the introduction of this book by Silverberg, Stepsons of Terra was his 6th published novel, written in October of 1957. Silverberg indicated that he’d had plenty of shorter stuff published before this work, though, as well as the five other novels. The original title of the book was Shadow on the Stars, and it appeared in the April 1958 issue of Science Fiction Adventures, edited at the time by Larry T. Shaw, who requested a novel from Silverberg. Later that year it was picked up by Donald Wollheim for his Ace Doubles book line, where it appeared opposite of a book by British author Lan Wright. In his introduction to “Stepsons,” which contains a wealth of good information, Silverberg says he’d written plenty of shorter “melodramas” for Science Fiction Adventures under various pseudonyms. By melodramas he means “blood-and-thunder,” and “blazing ray-guns” written “strictly for fun.” As is often the case when Silverberg talks about writing SF, he takes—at least to me—a slightly disparaging tone about the more pulpish aspects of the genre. This never fails to irritate me. Personally, his more pulpish tales are by far my favorites among his work. These include two that I read as a kid called Conquerors from the Darkness and Time of the Great Freeze. So, what was the result? In my opinion? Well, it was good but I think it would have been better with more of those pulp elements. It’s definitely a tale of intrigue rather than action and adventure. The adventure is certainly not “breathless.” Relatively little actually happens in the story, although the writing is good and the characters hold your attention. Too, Silverberg certainly does avoid the cliché descriptions of women often found in tales of the pulp era. And the epic space battle in the book is about as anti-climactic as you can get—certainly not cliché though. According to Silverberg, the book was very well received by the readers of Science Fiction Adventures and the next issue of the magazine was full of “letters of praise.” I’m sure it was, and I did enjoy the book. Not my favorite of his, though. I guess I’d have to say: give me more pulp. 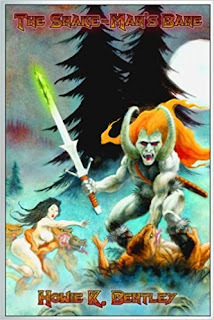 The Snake-Man’s Bane, by Howie K. Bentley, is a collection of heroic fantasy short stories from Wild Hunt Books. It contains: The Snake-Man’s Bane, All Will Be Righted on Samhain (with David C. Smith), The Heart of the Betrayer, Where There Is No Sanctuary, Thannhausefeer’s Guest, and Full Moon Revenant. Several have been previously published in magazines or anthologies but are collected here for the first time. Most are longish tales, which puts a lot of meat on their bones. All stories in the collection stand on their own but there is a common thread that runs through them. This is the character of Thorn, a kind of demon-god from the “Rune Realms” who feeds on the essence of other gods and often possesses mortal warriors to use as avatars in our world. Thorn does not appear in all the stories but there is a connection to him in each of the tales. The primary setting for these pieces is a mythical Europe. There are many hints to suggest that it is the same world, only later in time, as the world described by Robert E. Howard in his Hyborian Age Essay. Mention is made in the stories of Valusia (from Kull’s time) and Zamora (from Conan’s). There is mention of an imprisoned “elephant-headed god from beyond the stars” and of a “great warrior” who destroyed the tower where the god was imprisoned. This is certainly a reference to Robert E. Howard’s “TheTower of the Elephant,” which would make Conan the “great warrior.” In addition, the snake men of the title, who play a prominent role in the first story, seem quite likely to be related to the serpent men mentioned by Howard in some of his Kull tales. One thing that doesn’t quite jive with the setting as described above is that in the story “All Will be Righted on Samhain,” which was co-written with the excellent author, David C. Smith, there is mention of Rome and the historical Queen Boadicea of the Kelts. A time is even given, 60 CE. However, the main character of this tale, Boadicea’s daughter, Bunduica, becomes a sorcerer who is able to open doorways to other realms. This connected realm concept may explain how this particular story links to the others in the collection. Although the Howard influence is clear and spelled out for the reader in these tales, I also felt like there was a bit of influence from Michael Moorcock’s “Eternal Champion” series. In particular, the way that the demon-god Thorn inhabits various forms through time suggests this. At least to me. My favorite story in the collection is “Where There is No Sanctuary.” This tale starts out in a way that was reminiscent for me of Howard’s “The Frost King’s Daughter.” This story also features my favorite warrior character in the collection, Argantyr. Argantyr is a literary descendent of such heroes as Conan and Karl Wagner’s Kane, but he is unique to Howie Bentley, with a particular talent that I won’t spoil for you here. He’s quite an appealing character, albeit grim, and I’d love to read more about him.